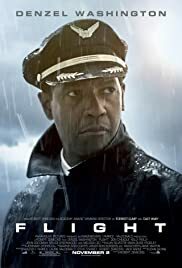 Flight is Robert Zemeckis’ first live-action film since Cast Away in 2000 and not only does it have an outstanding cast including Denzel Washington, John Goodman (last seen in Trouble with the Curve), and Don Cheadle (last seen in Crash), but it also has what appears to be an interesting and well-told story. Don’t disappoint me Robert Zemeckis. AFTER: If it wasn’t clear in the “Before” section, I have been hyping this movie up for months now. And as is usually the case in these situations, the film is almost never as good as the hype. Interestingly, it seems if you have low expectations going in and the film is even moderately good, it’s as if it is a masterpiece. What I’m trying to say, and doing so in a roundabout way, it that Flight, while a great film, didn’t live up to the very high bar I set for it. There was a lot of great stuff in the film starting with the acting. Denzel Washington plays the pilot of SouthJet 227, Whip Whitaker, in an Oscar-worthy performance. You quickly realize, even from the opening scene, that this film is much more than just a plane crash. Flight deals with alcoholism and drug abuse, loneliness, and family among other issues. Washington traverses the ups and downs of his character with such ease. He does it so well, the audience was verbally rooting for his character at the end to do the right thing (myself excluded, I was rooting for him silently - reason: see this related material). Washington is joined by a great supporting cast with huge credit, of course, going to John Goodman as Whitaker’s friend Harling Mays. The story has a great hook that is shown in the trailer: Whitaker flies the plane upside down in an attempt to salvage the landing. However, the more important part of the film is the fact that Whitaker was drunk and high when he flew the plane. This is where I begin to have some minor problems with the film. It’s not the premise of the story, it’s the structure. The actual crashing of the plane occurs at the end of Act I or about thirty minute into the film. Act II then follows Whitaker as he goes on and off drinking and the aftermath of the crash. Finally, Act III is Whitaker’s hearing about the day’s leading up to and the day of the crash. I had no problems with the first and last acts; they were well-crafted, showed what they needed to show, and got the job done. My issues lie with Act II; the meat of the film. It was a bit scattered in terms of organization and, especially compared to the rest of the film, wasn’t as successful or efficient in telling the story. As always, the question remains: should you go and see this movie. The answer is an easy yes. While Flight may not have lived up to my very high expectations and had some problems with the structure, at the end of the day, it’s still and entertaining film and a fun time in the theater. Especially seeing a plane flying upside down on a giant screen. Flight opens in theaters on November 2.